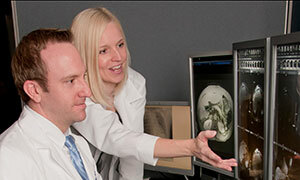 The department of Radiology at UMKC offers several different electives for those preparing for radiology, as well as other residencies. 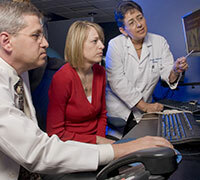 Rotations occur at Saint Luke’s Hospital of Kansas City, Truman Medical Centers, Children’s Mercy Kansas City, the Kansas City Veterans Affairs Medical Center and Research Medical Center. Read descriptions below and chose a radiology elective. Contact the rotation coordinator to see if the rotation is available. Once a UMKC or outside student has determined that a rotation is available, sign up through the UMKC SOM here. Saint Luke’s Hospital: The diagnostic radiology elective at St Luke’s Hospital is for highly motivated medical students interested in careers in radiology. 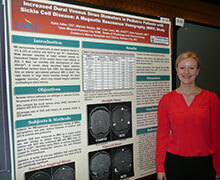 It is also well-suited for students looking for a broad exposure to radiology prior to residency in another specialty. Students will rotate through the major subspecialties in radiology and gain experience in radiologic anatomy, basic radiologic pathology and appropriate ordering of examinations. Students will also gain insight into the patient experience by spending time with technologists in each of the imaging areas. Students will make a presentation on a subject of their choice at the end of the rotation. Please click here for the elective information. T ruman Medical Centers: Medical students on the radiology rotation at Truman Medical Centers will spend time in an inpatient setting, shadowing a radiologist (resident and/or faculty) in both diagnostic and interventional areas (primarily diagnostic). Students will also gain insight into the patient experience by spending time with technologists and will collect four interesting cases to present to staff. Students are expected to be in the radiology reading room throughout the day, are given suggested readings to supplement their learning experience and will take a quiz at the end of the rotation. Kansas City VA Medical Center: This rotation is most useful for those wanting a broad, general exposure to radiology. 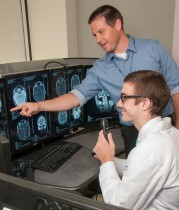 Medical students at the Kansas City VA initially work closely with technologists in a particular field ( X-ray, U/S, CT, MRI, NM – in that order) two-four mornings each week, followed by two-four mornings “shadowing” a radiologist interpreting imaging in that particular field at the radiologist’s work station. Afternoons primarily consist of computer-based self-learning along with the occasional lecture/informal teaching (interpreting radiographs, radiation safety, etc.). or (816) 861-4700, ext. 52425. This rotation is most useful for those wanting exposure to breast imaging and breast procedures, including students considering careers in diagnostic radiology and surgery, especially breast surgery. Medical students on the breast imaging rotation will spend time with breast imaging radiology faculty and residents assisting with patient care and procedures. Students interested in research may request opportunities while on this rotation or request an entire month of research depending on faculty need. Saint Luke’s Hospital: This rotation is most useful for those wanting exposure to interventional procedures, including students considering careers in diagnostic radiology, interventional radiology and surgery. 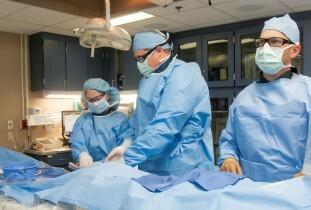 Medical students on the interventional rotation will spend time with interventional radiology faculty, fellows and residents assisting with patient care and procedures. Interested students may request research opportunities. Saint Luke’s Hospital: This rotation is most useful for those wanting exposure to diagnostic neuroradiology and interventional neuroradiology including students considering careers in neurology, diagnostic radiology and neurointerventional radiology. Medical students on the neuroradiology rotation will spend time with neuroradiology faculty, fellows and residents in both diagnostic and interventional areas. 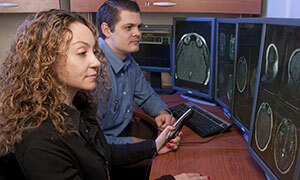 Interested students may request extra time in Interventional Neuroradiology and research. Truman Medical Centers: This rotation is most useful for those wanting exposure to diagnostic neuroradiology, including students considering careers in neurology and diagnostic radiology. Medical students on the neuroradiology rotation will spend time with neuroradiology faculty and residents in diagnostic radiology. Students will also gain insight into the patient experience by spending time with technologists, as well as collect and discuss interesting cases to present to staff. Students are expected to be in the radiology reading room throughout the day and are given suggested readings to supplement their learning experience. Children’s Mercy: The rotation in pediatric radiology is most useful for those wanting a broad exposure to pediatric radiology, including those considering a career in pediatrics or diagnostic radiology. Students will observe technologists obtain imaging studies, observe radiologists interpret and report studies, generate reports for unknown cases, present interesting cases, complete online modules and attend teaching conferences. There will be a pre-test and post-test, as well as a presentation on a topic of the students’ choice at the end of the rotation. Interested students may request extra time in various subspecialties, such as Interventional and neuroradiology. Students interested in performing pediatric radiology research may sign up for a one-month rotation based on availability and pre-approval of a project by a staff radiologist. Interested students must plan the rotation at least one month in advance and can begin the process by making an appointment with Amie Robinson at alrobinson@cmh.edu. Saint Luke’s Hospital: This rotation is offered in August annually. It is most useful for students desiring exposure to thoracic imaging, including those considering careers in diagnostic radiology and pulmonology. Medical students on the thoracic imaging rotation will attend 7:30 a.m. radiology lectures and spend time with thoracic radiology faculty and residents learning about chest imaging techniques, anatomy and pathology, such as evaluation of pulmonary nodules and neoplasms. General radiology at Research Medical Center: This rotation is offered variably throughout the year based on approval by Dr. Barry Gubin. 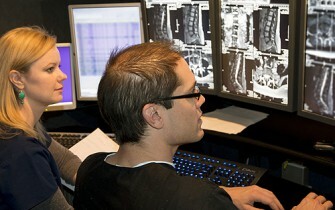 It is most useful for those wanting a broad, general exposure to radiology. Medical students on this rotation work with technologists in various areas of radiology and spend time “shadowing” various radiologists and interpreting imaging at their radiology work stations.